Hello friends! 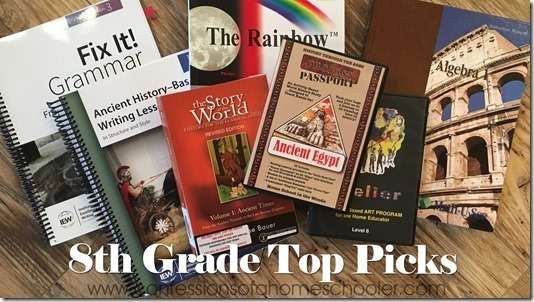 Today I’m sharing our top 8th grade homeschool curriculum picks. I know choosing curriculum can be a challenge, so hopefully this post will help give you a good starting point to choosing your own! So let’s get started! Here are the basic subjects that I suggest you cover for 8th grade. Of course you’ll want to make sure to check with your state requirements to make sure you’re including anything specifically required by your district. The * indicates subjects that are usually optional. To see exactly what my 8th grader will be doing this year watch our 2016-2017 8th Grade Homeschool Curriculum video here! 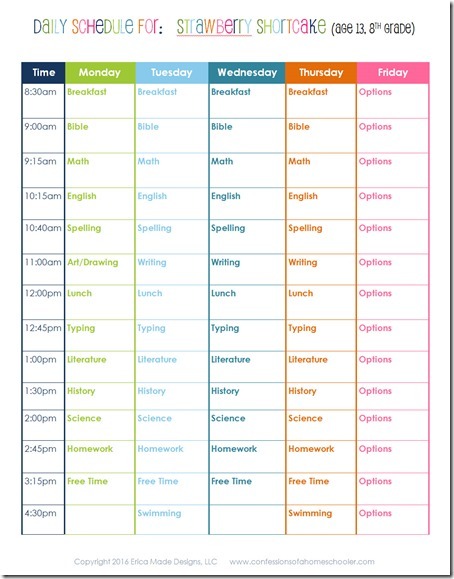 If you’d like to see how I organize our 8th grade homeschool schedule, click below to see what our typical 8th grade daily schedule looks like! I really like the Home Art Studio DVDs they’re a great way to do art class at home. They are sold by grade level, which might not work as well if you have multiple-grades represented in your home. But I’ve found that for the most part, if you pick a DVD closer to the upper grades in your home, you can have everyone do a project from one DVD and it will still be okay. The DVDs may cost a bit more, but they also take the pressure off of you to teach a lesson. If you’re not comfortable teaching art, you can simply gather the required materials and let the DVD do the teaching for you. YouTube: A great resource for my 8th grader and art has been YouTube. I have parental controls set for our YouTube and restrictions within the app as well. But there are a ton of free art videos available and my daughter absolutely loves to watch them. She’s created an entire drawing notebook full of really cool artwork just from watching drawing tutorials online. Of course with the content available on YouTube I refer you to this with caution and definitely suggest that you set up restrictions for it as well before letting your 8th grader search for tutorials online. Atelier Art is also a great DVD based art curriculum for older students. It is sold by grade level and includes principles of art, art-history, media exploration, creative self-expression, cultural appreciation, drawing techniques and more. Word of Life Champion Quiet Time Devotions . These are great for starting to teach independent Bible study for kids. They come by grade levels so you can get one that is appropriate for your child. We do one per day, and they only take about 5-10 minutes each. These are my favorite right now because they can be done independently. Character Studies: I have a series of FREE character studies available for download on my website. They’re great for teaching basic character skills to your kids while having a fun and engaging Bible study at the same time. You can find them all here on my Bible printables page, I hope you enjoy them! Kay Arthur Discover 4 yourself: These are great for kids who are good readers and ready for something a little more in depth. They have a reading assignment each day along with some specific Bible markings to help them remember the text and think about what it means in a more critical manner. These books are great for encouraging 4th-high school grade students to study their Bible more independently. I do NOT get the teacher’s guide for these book as they’re fairly self-explanatory in each lesson. By 8th grade I do not do a formal handwriting curriculum anymore. For most students there isn’t a need to practice handwriting anymore, and so at this point we focus more on typing skills. But you’ll want to do what fits your students needs best. Spelling You See: Most curriculum don’t focus much on spelling anymore past 7th grade. But I actually still have my students do the SYS program. It’s basically a copy work and dictation type of curriculum. But I really love the fact that they learn a variety of information in the passages. Each grade level has a different theme so students learn the information as they’re copying the passages. I recommend level G for your 8th grader, it’s currently the highest level they have at this time. I really don’t usually use the TM for this grade, there are dictation assignments, and for that we just tear out our worksheet and I read from their book. All About Spelling Level : This is the highest level of spelling for AAS at this time. So if you have completed all of their levels I wouldn’t add in anything else for spelling for 8th grade unless your student is still struggling in this area. One thing that you should note with this curriculum is that it’s teacher led, and we spent about 15-20 minutes each day working on our lessons. The books come with about 26-30 lessons for each level, and so I split the lessons into two parts. We do the new teaching one day, then the word writing and practice the following day. they use letter tiles to help students spell words which helps with really seeing and sounding out each sound, popular vowel teams, and consonant teams. At this point they’ve really learned most of the phonics rules and are working on harder word lists. Note: You will need the teacher manual’s for AAS as the lessons are only in the TM! Fix It Grammar: We will be using this English/Grammar program this year with my 8th grader. I really enjoy the IEW writing program, and have heard great things about Fix It! so I wanted to include it in my curriculum picks list. From what I’ve read it doesn’t take much time to complete the assignments which is nice. Students go through and edit a pre-written story from beginning to end. The stories are taken from popular literature, which is also a nice addition to their studies. The stories increase in difficulty as you progress through the levels. You can also move on to their theme based writing units once you feel your student has mastered the grammar side of things. BJU Press English 8: We have used BJU English previously and enjoyed it. You can see a video review of BJU Press English curriculum on my blog here. At this grade there aren’t lessons for you to teach, but instead your student reads the lesson themselves, then completes a worksheet. The TM is mainly used as an answer key to the student text book. This is nice because it helps create more independence for your student. However it can also be bad if you have a student who struggles in English. Abeka Grammar & Composition 2 If you like Abeka and want to stick with it, this is a good option for language and grammar. This curriculum continues to work on parts of speech as well as improving writing skills. I do recommend purchasing the teacher’s manual and the answer key for the student work pages. Quizzes and tests can be purchased separately if you wan those as well. Math U See Algebra 1: We have used Math U See for all of our kiddos for years. We have tried a couple of other math programs, but ended up going back to MUS because it’s just a much better fit for us. I like that it comes with DVD lessons, so I don’t have to teach them. I simply facilitate their work during the week, and help out when they have questions. Even though the skills are taught in a different order than traditional math where kids do a little bit of everything each day, I find that the MUS philosophy of mastering one skill before moving on to the next has worked well for our kids. BJU Online Learning: We are using BJU Press online learning for history and I absolutely love it! I have a full video review of BJU Press Distance Online Learning here if you’d like more information. I love that it is more student independent rather than teacher intensive. I also like that I still have some control over their grading. BJU Press makes it quite easy for me to log in each day and check their work as well as adjust any grades as needed. I also like the video lessons, the teacher is very clear with the content as well as any expectations she has of your student. They also offer quizzes and tests as well. The Story of the World and Time Travelers Project Passport combined. This year we are doing a combination of The Story of the World along with some of the Time Travelers Project Passport activities. I have reviews on both of these if you are interested. The Story of the World review here. Watch my Time Travelers Middle Ages Project Passport review here. Watch my Time Travelers Ancient Egypt review here. Abeka History 8: Abeka is a great option for those of you looking for an open and go type curriculum. It requires very little prep work on the teacher’s side. That said, there aren’t as many hands-on activities included. However they are easy and short daily lessons and can be purchased by grade level. One thing I like about this curriculum is that the reading assignments are really appropriate for each grade level and so I didn’t feel like I was teaching above my students understanding. One thing that I like about this curriculum for 8th grade is that you can assign these out for more independent work as well, having your student do the reading on their own. It’s a great way to continue teaching them critical study skills so they can learn how to read a text, take notes, then study from those notes to prepare for a quiz or exam. This curriculum is also great if you’re looking for something that doesn’t require much preparation on your part. Evan-Moor History Pockets: These are a great way to include some more hands on activities with your students. They aren’t really a full stand-alone curriculum. However, they were an excellent addition to our Abeka unit as well. The books come in a variety of topics and have one short lesson followed by a lapbooking type activity for each reading passage. I felt that they were a nice addition to our curriculum. And they weren’t very time consuming. The only preparation work required for you is to make copies for your kiddos. Depending on my student’s skill level, I do not normally do a formal reading program for 8th grade. If they are reading well, I will often search for an 8th grade literature book lists and let my student choose books off of that. I’ve found that they tend to enjoy reading more when they can pick something they’re interested in as opposed to doing a more structured reading curriculum. We still do comprehension practice with all of our reading units. That said, here are a few more formal curriculum choices to get you started. Abeka 8 Reading: Abeka offers a literature unit for your 8th graders that includes popular literature as well as a compilation of selections based on pioneers, pilgrims, patriots, professional athletes and other famous people. They include vocabulary words and think it through sections to help promote comprehension. BJU Press Literature 8: BJU offers a literature curriculum for 8th graders that is a compilation of stories, poems, and essays from a variety of authors. Each one includes a critical thinking section to help students with comprehension and critical analysis of what they’ve read as well. Book Shark: We used this curriculum from our options program last year. And while I didn’t love all of the books, there were definitely a good selection to choose from. The curriculum also comes with a history section, so you can use this for both history and reading. They also have a full curriculum selection which includes other subjects as well, however we just used the reading portion. Since this program was free for us through our options program it was a good addition to our homeschool. However it can be quite expensive if you were to purchase the curriculum new. If you are interested in this program, I would probably try to get the TM used online, then get a hold of the books from your local library or used if you can find them as well. World’s Greatest Composers Vo.l 1 OR World’s Greatest Composers Vol. 2: These units are a great way to learn about some of our world’s most famous musicians. You will learn a ton about the work of each musician and become well familiar with their style and works. Students will also learn to discuss the music in a critical fashion as well as gain an appreciation for the art in general. they will complete listening studies each day that include an accompanying project. Each study includes: Lesson plans for each week , a lapbook, note booking pages for older kids, puzzles, musician fact cards, and listening assignments that correlate with each artist. Music lessons: Instrument lessons depending on child’s interest. We’ve also done Teach Yourself Piano, private lessons, guitar, etc. I will say that the Teach Yourself Piano is a great starting point, but if you want to progress you’ll want to move onto private lessons at some point. The lessons are short, and students learn songs right away which is a nice motivator. They do label your keyboard with number stickers then later on letters which help students learn. The Rainbow Science: The Beginnings Publishing house has a great high school level science curriculum complete with labs. We used this for 8th and 9th grade and have so far enjoyed it. You can see my full review of The Rainbow Science curriculum here. World’s Greatest Scientists: These are super fun units where students can learn all about 7 of our world’s greatest scientists. Each study includes fun hands-on activities to go along with the unit to help students remember what they’ve learned, and also provide them with a fun reference too to review and recall each person they’ve learned about. The lessons also include book reports, vocabulary, character traits of these important figures, and critical thinking skills. They’re normally for a bit younger of students, however if you haven’t studied them yet, I suggest finding some good online biographies for each as you go through them to make this curriculum heartier for 8th grade students. Abeka Science 8: Abeka science is also a good option if you’re looking for easy short lessons with not much fuss on your part. There are a few experiments included, though the curriculum as a whole is not that hands on. I do like that it is fairly independent work for your student and teaches them basic study skills where they can learn how to read a text, take notes from that and then prepare and prepare for quizzes and tests on their own. Lessons are short and to the point, and you really don’t need much prep work. It does cover an overview of a variety of topics in one year which is nice, and like I said it’s fairly easy with little prep work for you. I usually get the TM, student text, and any accompanying flashcards, quizzes, and activity sheets. You can often find Abeka used, so check used sites before buying new! Abeka also offers online courses as well. BJU Press Science 8: This science is similar in format to Abeka. Students have required reading with some scientific experiments pertaining to the reading. There is a bit of preparation on your part, but nothing too difficult as long as you plan ahead a bit. You will need the teacher’s manual, student tests and answer key, along with the student activities manual if you plan to do those. BJU Press also offers online courses as well. ROBOTICS: LEGO Education I recommend starting with the Simple Mechanisms set, if you’ve already completed these lessons they also have add-on products that cover hydro-electricity, wind energy and a few others. We did this as a co-op with some other families, but you could also do it at home. Each set is intended for 2 students to share. There are activity lesson plans you can purchase and then the students use the kits to learn all about a variety of robotics related topics. They build various models, test them, then modify their creations to get a variety of desired results. While this was an optional subject, I really wanted to list it here because I think the lessons were really cool, fun, and valuable in encouraging critical and logical thinking skills, as well as creativity and teamwork. The LEGO Mindstorm activities are also a great robotics unit for older students. Extra-curricular sports: Because we do a variety of sports in the afternoons/evenings depending on our children’s interests, we don’t do a formal PE program at this time. Right now we’re doing a mix of swimming, ice skating, 4-H, horseback riding and ice hockey. We’ve also done dance, gymnastics, lacrosse, baseball, basketball, and cheerleading. I suggest finding something your child is interested in and get them involved in a sport. It’s a great way to get exercises and have fun at the same time. Udemy is a wonderful online learning area where your students can find classes on just about anything. We love to use this for computers/programming skills and have enjoyed quite a few smaller courses found on the site. Typing Web (free online typing program): We’ve been using Typing Web for a few years now and I find that it’s a great way to improve typing skills. One thing I’ve found that helps is doing typing on a daily basis. So we’ve scheduled it for 10 minutes per day 5 days per week. The best part is that the lessons are free. You just sign up as a parent account and then add your students under your account. If you haven’t done typing yet, I would highly encourage you to start now. To get more typing practice in I typically allow my students to type their reports and writing assignments by grade 7. I’ve found 10 minutes is short enough that they don’t mind doing it, but enough practice to help them become relatively fluent typists over the course of the year. Vocabulary Workshop Grade 8: I’ve found vocabulary workshop to be decent as far as vocabulary goes. It’s basically a workbook with a reading selection, word lists, and then worksheets using the vocabulary presented in the reading portion. It’s not very exciting, but seems to work well. They also offer SAC and ACT test prep as well. Fix It Grammar The Fix It! Grammar is both an English/Grammar curriculum but also includes vocabulary words that students look up and write down the definitions for. They only do one word per day, so depending on how rigorous a vocabulary program you want, that’s something to take into consideration. We have found this sufficient for 8th grade and haven’t supplemented with anything else. Institute for Excellence in Writing: We’ve used IEW for a couple of years now, and I really like how it teaches writing skills. I have definitely seen an improvement in my student’s writing as well. IEW has DVD based lessons, then assignments that correlate with the video lessons. I really like that I don’t have to teach this particular subject, but instead I can just facilitate the homework. We all watch the video together, then my students complete the assignments as directed. I really like the teaching method they use and thing that the check lists have really helped my children learn how to write interesting and properly formatted paragraphs. I also love that it has a banned word lists as well as a check list so students are encouraged to use more colorful words and they have a clear outline of what’s expected of them for each assignment. I suggest starting with their Student Writing Intensives and then you can move forward from there. This year we are using one of their History Based writing curriculum. When preparing your curriculum for 8th grade I think the best advice I can give you is to continue focusing more on independent work for your student. If you haven’t already I encourage you to start teaching them how to read a text, take notes, then study and prepare for quizzes and exams from those notes. –>> Check out my Study Tips 101 video series here! Since the workload is a bit more serious at this point, I still like to plan in a few fun field trips wherever we can fit them in or where they correlate with our lessons. I also make sure to keep track of my student’s workload when planning the year. I use a sample schedule (see above) to chart how long each subject will take before buying curriculum at this stage. I also like to include more student independent work to help prepare them for high school where they will be required to work more on their own. If time allows I also like to choose an elective curriculum that is more hands-on and engaging. My daughter really enjoyed the The Foto Finch Composition photography curriculum, and I’ll probably try to teach her some Photoshop skills as well next year. Continue teaching them how to work diligently and more independently where appropriate. I like using the workbox system to help my students learn to complete tasks more independently, and yes we still use them for 8th grade! Here’s a video on our workboxes and how we use them in our school! I hope this has helped you in planning your homeschool curriculum for your 8th grader! 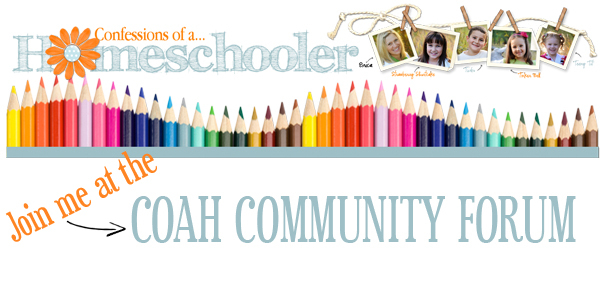 Make sure to check out our other top homeschool curriculum picks here! Don’t forget to stop by the COAH Community to see what others use for 8th grade too! Have questions? Start your own discussion! Disclosure: Some of the links in this post are affiliate links which means I get a small percentage if you purchase through my link. That said, please know that I do NOT recommend anything unless we like and use it!! Hi! I saw your suggestions for art/YouTube. Do you have any specific art channels you like for art? We are going to start homeschooling for my 14 years old teen. This is scary because she is at that age where friends and peers are everything and nothing else exist. How do you recommend to start the conversation and how to make Homeschooling successful for all of us.